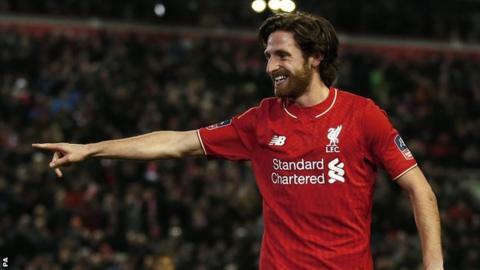 Liverpool have not discussed a new contract with Wales midfielder Joe Allen, BBC Wales Sport understands. Allen, who joined Liverpool from Swansea City for £15m in August 2012, has 14 months left before his current deal expires. The 26-year-old has previously said he is playing for his long-term Anfield future. Liverpool rejected an enquiry from Swansea about re-signing their former player on loan in January. Allen has only started four Premier League games this season including Sunday's 4-1 win over Stoke City. He received a standing from Liverpool supporters after being substituted and was praised by manager Jurgen Klopp. "He was brilliant. There is no other word for this. We only took him off because we need him," Klopp said. "Joe is not 100 percent fit, but it is not possible because he couldn't train often enough. He was always on the bench because we have needed him. "Hopefully he stays healthy forever and now he's a really good option." Allen has been given his chance after captain Jordan Henderson suffered a knee injury in the Europa League quarter final first leg win over Borussia Dortmund. He is likely to retain his place in midfield for Thursday's second leg tie against Klopp's former team at Anfield.